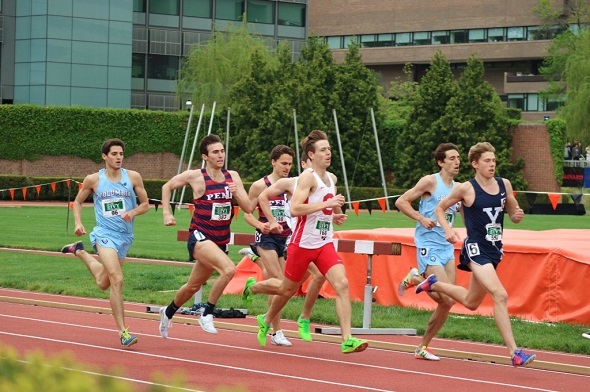 The men’s 1,500m kicked off our block of preliminary rounds for the day. Two heats are scheduled, with the top four in each heat and then the next 2 fastest make it to the Sunday finals. Top seed James Randon of Yale secured his bid to tomorrow’s finals by dropping a 55 second final 400m, running 3:47.20 to win heat 1. Penn’s Chris Hatler finished second in 3:47.68, followed by Columbia’s Ben Ritz (3:48.74) and Dartmouth’s Tim Gorman (3:48.88) as the remaining autos. The second heat was won by Cornell’s James Gowans in 3:54.31. The heat was more tactical as the auto qualifiers had a tighter finish with Princeton’s Garrett O’Toole in 3:54.33, Columbia’s Rob Napolitano in 3:54.40, and Princeton’s Luke Brahm in 3:54.90. This resulted in the at-large qualifiers coming from heat 1 – Cornell’s Sam Baxter (3:49.04) and Columbia’s Spencer Haik (3:49.38). The men’s hurdles take the top 3 in each heat and the next 2 fastest. Yale’s Paedyn Gomes took heat 1 in 14.33, while Penn’s Ben Bowers (14.34) and Cornell’s Austin Jamerson (14.47). Yes, Jamerson is doubling up with the decathlon and the hurdles. Cornell’s Max Hairston set a new meet record in heat 2 to win in 13.86, while Princeton’s Greg Caldwell (14.31) and Harvard’s Jay Hebert (14.34) got the other autos. A pair of freshmen got the at-large qualifiers: Cornell’s Austin Lyons (14.52) and Dartmouth’s Alex Eschholz (14.42). Cornell also send another three men to the 400m final, led by Tobe Attah’s leading time of 47.15 to win heat 2. Yale’s Marc-Andre Alexandre – the defending champion – had the second fastest qualifier in 47.69 to take heat 3, while Princeton’s Ray Mennin – the Indoor Heps champ – won heat 1 in 47.86. Other qualifiers include Penn’s Jeff Wiseman (48.24), Cornell’s Michael Smith (48.32), Columbia’s Johanan Sowah (48.50), Cornell’s Larry Gibson (48.55), and Columbia’s Yelnats Calvin (48.57). Penn’s Thomas Pitt only needed three jumps to claim his first Ivy League title. He won the men’s long jump with a distance of 23-11. Cornell’s Alex Rodriguez was one inch back, 23-10, to finish in second place and leading a Cornell 2-3-4 finish with Kelsey Nedd and Jamerson (who only got three jumps in due to his obligations in the decathlon and hurdles). Even with three-time defending champion Julia Ratcliffe taking the season off, Princeton will be taking home another women’s hammer crown as Kennedy O’Dell won in 180-09. Brown’s Michelle Bazile set a huge new personal best to get All-Ivy honors – a distance of 173-11. The women’s heptathlon has moved on to the shot put. Harvard’s Allison Morrison had the highest clearance in the high jump – 5-07 to get 855 points. The performance moved Morrison into fourth place in the overall standings. Her teammade Madison Hansen has extended her overall lead to 1806 points after three events, 52 points ahead of Princeton’s Taylor Morgan (1754 points). Dartmouth’s Allison Frantz sits in third with 1735 points, while Morrison is in fourth with 1713 points. Back to the track preliminary rounds – Cornell freshman Zach Menchaca sprinted into the championship meet top 10 listing with his preliminary round time of 10.51 – ties him as #8 in meet history. He is one of four Cornellians who made the 100m final, along with Alex Beck (10.73), Brailin Paulino (10.76), and Ryan Hynes (10.83). Princeton got three into the final, led by Carrington Akosa (10.62) as well as Charles Volker (10.78) and Josh Billington (10.75). Brown’s Ryan Kelly (10.72) is the lone non-Red or Orange/Black in the sprint final. This entry was posted on Saturday, May 7th, 2016 at 12:08 pm. It is filed under Heps Champs, Spotlight. You can follow any responses to this entry through the RSS 2.0 feed.